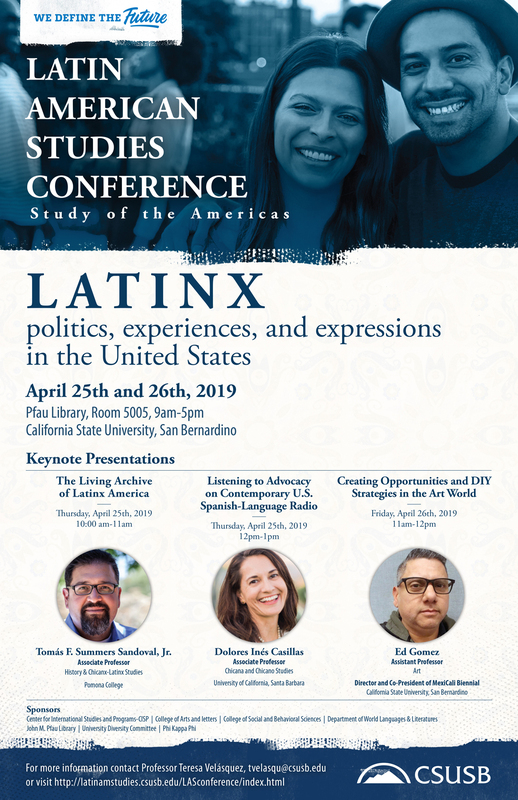 The annual Latin American Studies Conference: Study of the Americas at Cal State San Bernardino on April 25-26 will explore Latinx politics, experiences and expressions in the United States and the U.S.-borderlands region. The annual Latin American Studies Conference: Study of the Americas at Cal State San Bernardino will explore Latinx politics, experiences and expressions in the United States and the U.S.-borderlands region. The two-day event, which will be on Thursday, April 25, and Friday, April 26, will be in the John M. Pfau Library, room PL-5005, from 9 a.m. to 5 p.m. both days. Tomás F. Summers Sandoval, Jr., associate professor of history and Chicanx-Latinx studies at Pomona College, will present “The Living Archive of Latinx America” on Thursday, April 25, from 10-11 a.m.
Dolores Inés Casillas, associate professor of Chicana and Chicano studies at the University of California, Santa Barbara, will present “Listening to Advocacy on Contemporary U.S. Spanish-Language Radio” on Thursday, April 25, from noon-1 p.m.
Ed Gomez, assistant professor of art at CSUSB and director and co-president of MexiCali Biennial, will present “Creating Opportunities and DIY Strategies in the Art World” on Friday, April 26, from 11 a.m.-noon. The event will also have talks and presentations from CSUSB students and members from local universities in the region. The annual conference is intended to foster interest, knowledge and understanding of the very diverse cultures of Latin America and the Caribbean. It welcomes research in Latin American and Caribbean art, culture, music, indigenous peoples, literature, economics, politics and history. This year’s conference is sponsored by the Center for International Studies and Programs (CISP), College of Arts and Letters, College of Social and Behavioral Sciences, Department of World Languages and Literatures, John M. Pfau Library, University Diversity Committee, and Phi Kappa Phi. To register for the event, visit the Latin American Studies Conference website. For more information, contact Teresa Velásquez, associate professor of anthropology, at tvelasqu@csusb.edu or visit the Latin American Studies Conference website.